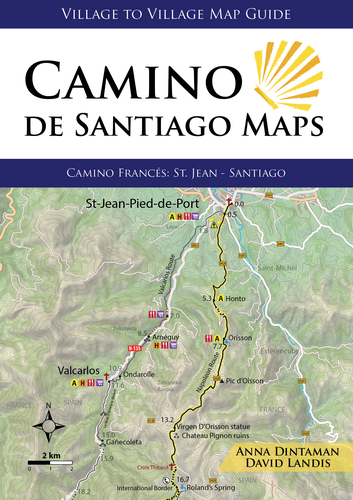 This lightweight, minimalist map guide offers all the detailed maps, accommodations listings, and stage overviews available in the full Camino Francés Village to Village Guide, condensed to an ultralight 96 pages. The Camino Francés begins in picturesque Saint-Jean-Pied-de-Port in France, crosses the Pyrenees and Basque country and the high plateau known as the Meseta before entering the misty mountains of Galicia. This 500-mile journey arrives to the Cathedral in Santiago de Compostela, where the bones of Saint James are said to reside. With full-color stage maps and city maps, youll always know where you and where youre going. Detailed accommodations listings show everything you need to know about pilgrim hostels (albergues) as well as private accommodations for each budget. Planning and route tips keep you informed, in a pocket-sized book that weighs just 100 grams. All the information you need (without any fluff) to walk the 500-mile classic Camino Francés, a pilgrimage experience across northern Spain.